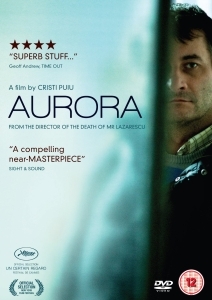 A follow-up to the acclaimed The Death of Mr. Lazarescu (2005), Cristi Puiu’s Aurora (2010) took three years from its premiere in Cannes to reach UK shores. With a runtime of over three hours and a characteristically languid approach, there’s no surprise it’s taken this opaque Romanian portrait of a killer so long to surface. An upturned murder mystery where the murderer is known but his motives and deliberations remain guarded, Aurora sees Puiu star as Viorel, the film’s straight-faced protagonist. A recently divorced father of two, Viorel lives a secluded life on the outskirts of Bucharest in a dilapidated flat. Viorel’s an engineer at a small factory and spends his days evading any form of human contact. At night he wanders across the desolate train tracks and factory courtyards of the city’s rundown industrial sector, spying on the same family. However, this painstakingly natural portrait ultimately concludes in a startlingly methodical series of murders. For the film’s first hour, we witness the everyday interactions and humdrum routines that constitute Viorel’s day-to-day life. Whilst undeniable challenging, this approach successfully immerses us within his dangerously numb perspective on life. Detached from the action yet aware of each intrinsic act which takes place, the documentary-style probing of Puiu’s direction and the lack of any establishing shots or dialogue is akin to watching a film through a half-open window. For those with the patience to tackle Puiu’s meticulous character study, there’s certainly sufficient development to caress your interest into why this clandestine individual takes such extreme action. From the irregular musing over Red Riding Hood in the film’s opening to the stunted dialogue Viorel shares with a neighbour, Puiu layers this sombre meditation on the mind of a killer with just enough ominous overtones to alert us to the significance of each incongruous deed. With most of the action which unfolds devoted to these subtle philosophical musings and banal undertakings rather than the motives behind Viorel’s violent actions, the audience, whilst heavily involved in his secluded life, fail to emphasise with such a surreptitious protagonist whose motivations remain concealed for so long. Like recent Romanian hits Police, Adjective (2009) and Beyond the Hills (2012), Aurora concludes with a disquisition with a collection of bumbling police officers. It’s in these final 20 minutes that Puiu helps piece everything together and ultimately rewards the audience for their patience and attention to detail throughout this prolonged study. It’s here that we realise that Aurora is an obsidian black comedy-of-sorts built around a singular joke about the mindset of a criminal and the complexities that the pragmatic nature of law struggle to comprehend. It remains to be seen, however, if the gruellingly methodical cinema of Puiu is equally equipped to tackle such a grandiose theme. There’s certainly more to come.